Coke isn't just "the real thing" anymore. It now is also the virtual reality thing. A video released by the soft-drink giant reveals three different ways that consumers can turn recycled cardboard packaging for Coke into Google Cardboard-esque VR viewers. All you need is the packaging, a phone and scissors. Plastic lens are not provided. Coke does print a note letting people know that apps and games developed for Google Cardboard will work on the Coke VR viewer. Coke hopes to sell more soda with this marketing campaign. Consider that Google has shipped more than 5 million units of Cardboard, and more than 1000 apps for Google Cardboard are now available. 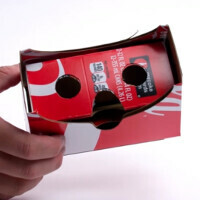 Looking at it from the other side of the equation, putting a cardboard VR viewer on Coke packaging is sure to bring more attention to the VR apps that are already available in the Google Play Store. Learn how to create these Coke cardboard VR viewers by clicking on the video below. It appears they do, but it's not difficult to imagine the quality of the image.